After having done several Odwalla reviews, I figured their bars were mostly the same in that they were soft, pliable bars that consisted of various fruits. On a recent trip to Kroger, I was surprised when I saw a type of Odwalla bar that I had never seen before in this Odwalla Chocolate Almond Coconut Chewy Nut Bar. 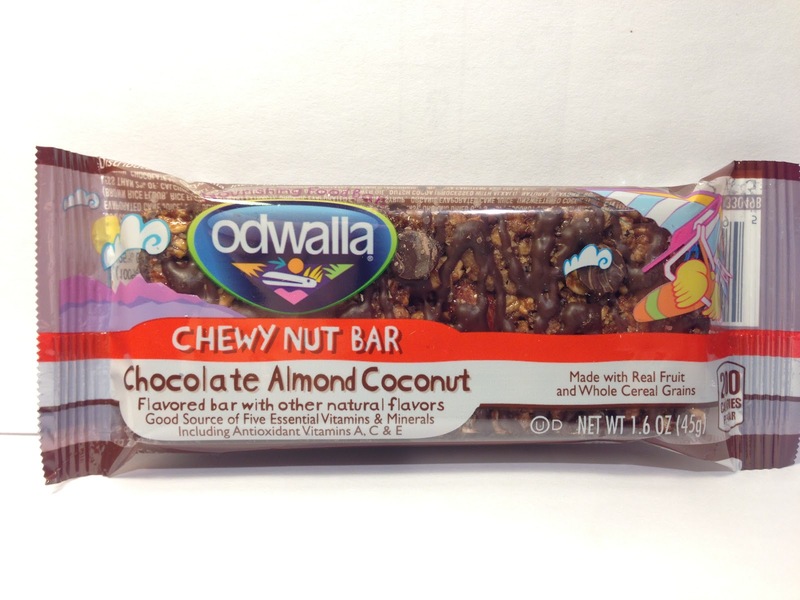 I didn't know that they had nut bars, so this was news to me. As for the numeric specifics of the bar, I picked it up on sale for $1.00 and it came in at 1.6 ounces and 200 calories with four grams of protein. It's also made with real fruit and whole cereal grains, so hooray for that. My first observation when I ripped open the wrapper of this bar was less of an observation than it was an almost fainting spell. The smell of the coconut coming off this bar was so strong that it nearly knocked me out. I'm more than okay with coconut, but I'm not all that okay with something smelling so overpowering that it almost knocks me off my feet. Coconut smell notwithstanding, the rest of the bar was a oat/rice crisp base with cocoa powder mixed in for that brown coloring. Within that mix were additional semi-sweet chocolate chips of a decent size and also coconut shavings. The bar was then topped with a decorative chocolate drizzle to jazz it up, so between the cocoa powder, chocolate chips and chocolate drizzle, it was definitely a war between what flavor was going to win out versus the coconut. Based on smell alone, I would have to say my money was on the coconut. Also in the mix, although not all that large, were a smattering of almond shards. One other note is that despite the fact that the size in terms of measurement of this bar seemed quite spacious, it was very light in terms of how it felt to hold, which obviously means that the bar itself is quite airy in its construction. It was a good bet because after my first bite, nearly everything I tasted was coconut. The chocolate was there, but since it was only semi-sweet chocolate, it wasn't particularly sweet which was fine since the coconut provided the majority of the sweetness that the bar needed. In my estimation, the chocolate was mostly there as a coating and as a way to try to break up the muscular coconut flavor. The chips provided a soft pop, but quickly melted in your mouth to provide more chocolate coating. One thing that was surprising, although not in a taste way, was the almonds. While they didn't provide a lot of flavor, the small shards of coconut did do an excellent job of breaking up the texture of the bar and adding some crunch to the soft oat/rice crisp mix and that was very welcome because without the almonds, this bar would have been a one not bar of soft chewiness with nothing to break that up. It also seemed like there were more almonds that I observed originally and being that I'm a crunch lover, I loved that. All in all though, the bar was so overwhelming with coconut flavor that everything else was just an afterthought. Buy It or Fly By It? I like coconut quite a bit, but this bar bordered on being too much coconut. That said, it wasn't so much that I found it unappealing (at least to me), so I'll give this a BUY IT rating. This bar definitely is not for people that don't like coconut or ambivalent to it though because the coconut in here is probably too much for those kinds of tastes. 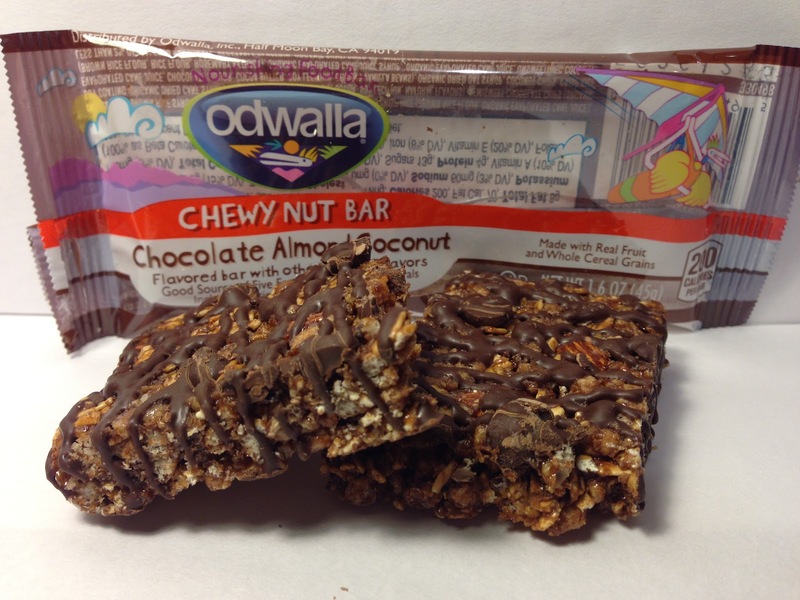 If coconut is your thing though, you will love this bar.